…より上に[へ], …より高く[い]; …の上に(出て) (⇔below) 《★【類語】 above は…から離れてそれより上のほうに; over は…の真上に，または…の上にかぶさっている場合をいう》. fly above the trees 木の上を飛ぶ. The peak rises above the clouds. その峰は雲の上にそびえている. New York is above Pennsylvania. ニューヨーク州はペンシルバニア州の北の方にある. speeds above thirty miles an hour 時速 30 マイルを上回るスピード. men above 20 (years old) 20歳より上の人々. He's above me in rank. 彼は私より上役だ. Don't live above your income. 収入以上の生活をするな. I value honor above life. 生命よりも名誉を重んじる. The book is above me [my understanding]. その本は私には難しくてわからない. His bravery is above all praise. 彼の勇敢さは称賛の言葉がない. He's above telling lies. 彼はうそを言うような人ではない. I'm not above asking questions. 私は質問することを恥じない. He lives on the floor [in the room] above. 彼はすぐ上の階に[真上の部屋に]住んでいる. appeal to the court above (すぐ上の裁判所に)上訴する. persons of fifty and above 50歳以上の人々. as (mentioned [stated]) above 上[上述]のとおり. [the above; 名詞的に，集合的に] 上記[以上]のこと[人] 《★【用法】 集合体と考える時には単数，構成要素を考える時には複数扱い》. The above are the facts as stated by the defendant. 上記が被告の述べた事実である. The sun is still above the horizon. Their apartment is above an antique store. She has a mole above her right knee. There is a village three kilometers above this bridge. My score is a little above average. It's above our original estimates. He couldn't get a job because he was above 40 years old. The math problem is above me. I'm above such childish behavior. I'm above telling a lie. You may go above your boss and talk to the president directly. Above all , we need to improve the economy. He got above himself because he got a special award. Let us go back to the above again. From Middle English above, aboven, abuven, from 古期英語 ābufan, onbufan from a (“on”) + bufan (“over”), (akin to Icelandic ofan (“from above”), Middle Dutch bōven, Old Frisian bova, Middle High German bobene) from bī (“by”) + ufan (“over”); also cognate with Danish oven, Dutch boven, German oben, Swedish ovan, Old Saxon oƀan, Old High German obana. The preposition, adjective and the noun derive from the adverb. He always put his coat on above his sweater. Then came a maid with hand-bag and shawls, and after her a tall young lady. She stood for a moment holding her skirt above the grimy steps, […] and the light of the reflector fell full upon her. Even the chief of police is not above suspicion. He was always above reproach. Thy worth […] is actions above my gifts. That amount is way above our asking price. Too proud to stoop to; averse to; disinclined; too honorable to give. The owner was above taking more than a token salary. (surpassing in number または quantity): passing into the adverbial sense. He's in a better place now, floating free as the clouds above. He appealed to the court above. It was a cold day at only 5 above. (biology) On the upper half or the dorsal surface of an animal. The sparrow I saw was rufous above and off-white below. "Above" is also used as the first part of a compound in the sense of before, previously; as, above-cited, above-described, above-mentioned, above-named, above-said, above-specified, above-written, above-given. (archaic) betterment, raised status or condition. […] that he had no doubt but that they should come to their above on the morrow. 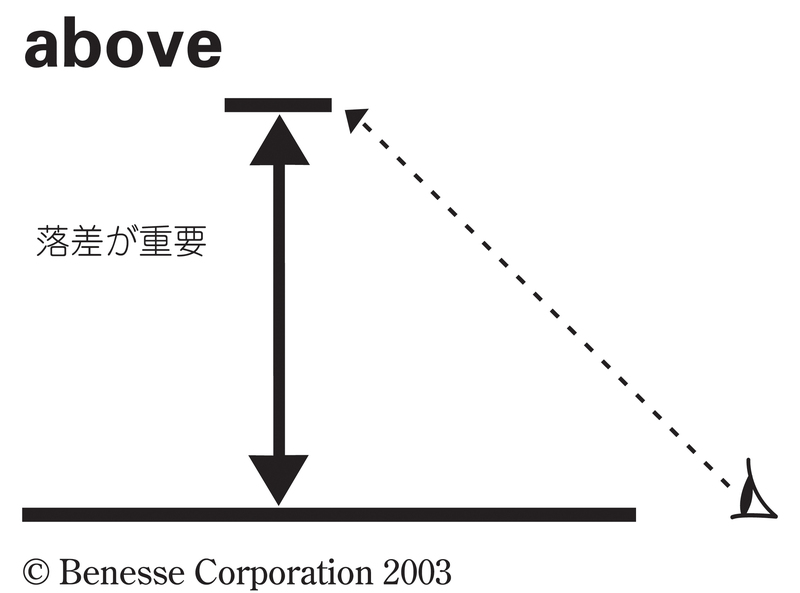 Above is often used further elliptically as a noun by omitting the noun, where it is should be clear what is omitted.